Steve Jobs is undoubtedly a huge fan of The Beatles. Their music can often be heard playing before Apple’s press events. Ironically, the Fab Four are nowhere to be found on iTunes–until now. Steve Jobs is undoubtedly a huge fan of the Beatles. Their music can often be heard playing before Apple press events. Ironically, however, the Fab Four are nowhere to be found on iTunes–until now. Apple is preparing to announce a deal that would give its iTunes store the rights to carry the Beatles’ catalogue of music, reports the Wall Street Journal. The seminal rock ‘n’ roll band is the biggest hold out on iTunes, but not the only one–Led Zeppelin, Kid Rock, Pink Floyd, and AC/DC are among the others. According to sources close to the matter, the Beatles deal may have been struck last week, when reps from Apple, Apple Corps Ltd., and the Beatles’ struggling label, EMI, met to iron out the details. Is this the announcement Apple is planning for tomorrow? At the very least, the deal will end one of the longest running legal battles in music history. 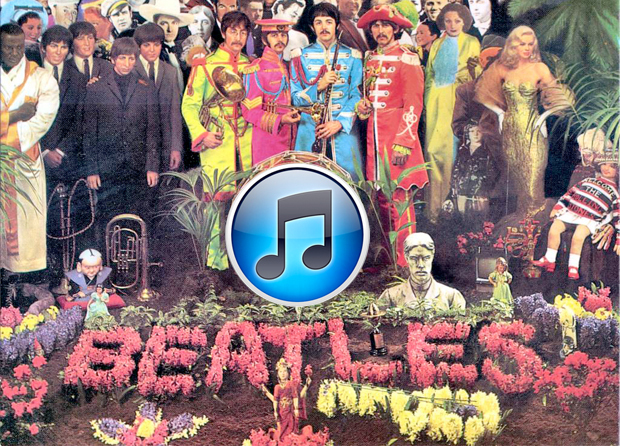 Apple and the Beatles began on rocky ground, when, in 1978, the Beatles alleged trademark infringement against Apple Computer, as it then was. The Beatles’ company was called Apple Corps Ltd., and they felt Steve Job’s Apple and logo violated their trademark. That was settled when Apple Computer promised not to get into the music business … and we all know how that turned out. Along the way, lesser companies have tried to offer Beatles music digitally. Most recently (and awkwardly), digital music expert and one-time Huffington Post blogger Hank Risan stated BlueBeat music with the aim of offering 25-cent tracks of Beatles music made, he said, not by the Beatles but by virtual simulations of their voices and instruments. After label EMI sued, a federal judge failed to buy Risan’s rationale and shut him down. Spizer speculates that the iTunes deal was probably part of the settlement between the the two Apples and is only now coming to fruition. He points out that iTunes released Come And Get It: The Best of Apple Records (Remastered) on Oct. 22–it contained just about every artist the Beatles label put out except the Beatles (Billy Preston, Ronnie Spector, Badfinger–even the Hot Chocolate Band, for Christ sakes). “It would make sense that the Beatles catalog would follow,” Spizer says. He says he’s not bothered by the digital format from an audiophile’s standpoint, either. “People that are listening on iTunes are listening with headphones and not getting the same quality you’re getting through a high-end stereo system,” Spizer says. Although the Beatles haven’t fully gone digital for decades, the group have signaled a willingness to make the transition. The Beatles: Rock Band was released last year, along with a remastered catalogue, to big sales. And that’s not to say they even need to go digital. The Beatles sold 3.28 million albums in 2009 and has sold more than 177 million albums in the U.S. to date–without help from iTunes.